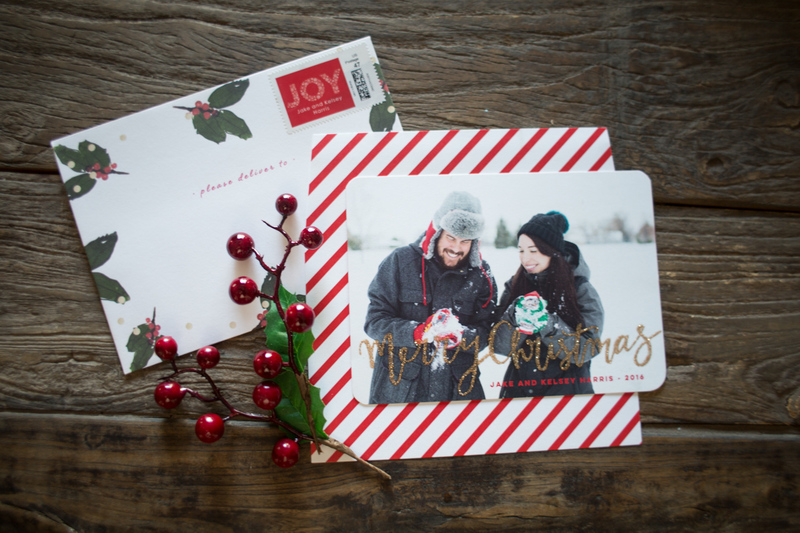 It’s that time of year again… HOLIDAY CARDS! Jake and I both grew up with our parents sharing Holiday Cards with loved ones, and that is one tradition we both have wanted to carry on in our family! We’ve found it’s a great way to say hello to those we don’t get to see often enough but want them to know we are thinking about them. 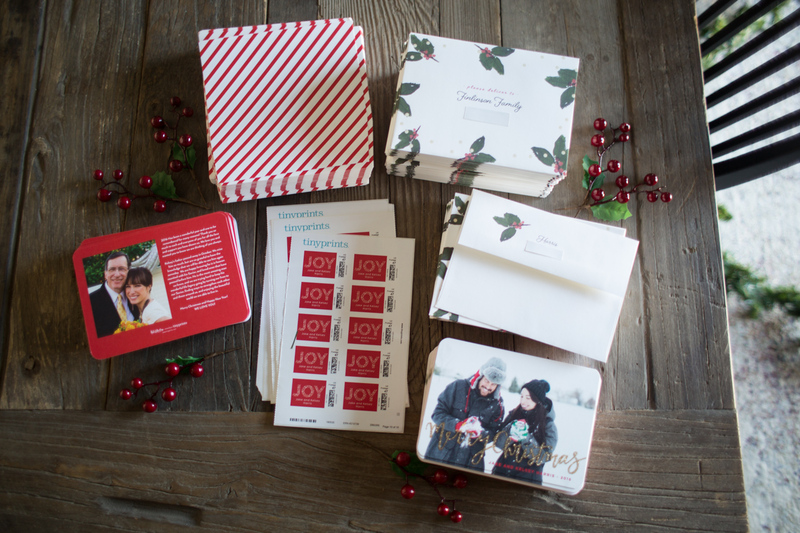 We love how sending holiday cards is an easy way for us to stay in touch and share a little life update with them! My cute dad recently passed away and so the tradition of carrying on Christmas Cards for our family is even more important to me now than ever. I have so many memories growing up of all my sisters and fam getting fun matching outfits for Christmas Pictures! One of my favorites was getting our photo taken at our family cabin! We all dressed in red and green dresses and after photos we went out for burgers and shakes at one of our favorite places! I remember being in our formal outfits at the diner and thought it was so fun! 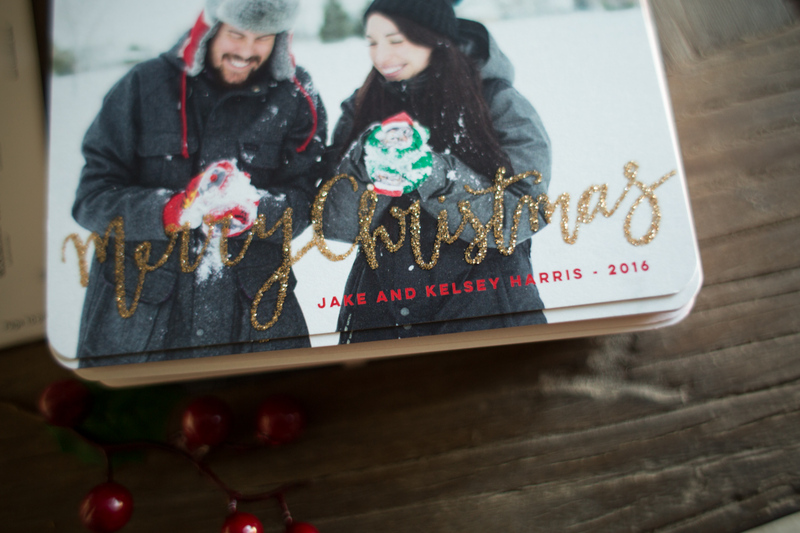 The past few years we have picked to go with Tiny Prints for our Christmas Cards because we have loved how they have turned out! There were lots of fun holiday card options like foil stamped (to add a luxurious look), laser cut, ornament cards and more but we wanted to try something new that we hadn’t done for our cards this year! We went with the Enchanting Script Black Holiday Glitter Cards. When we got the cards in the mail I was so impressed with the glitter how it has dimension to it and the glitter does not rub off! DREAMY! With Tiny Prints you can get the back of your card printed with text and pictures on it for no additonal cost! This year we couldn’t miss putting a little something about my dad on the back, a message to our loved ones, and a cute picture! 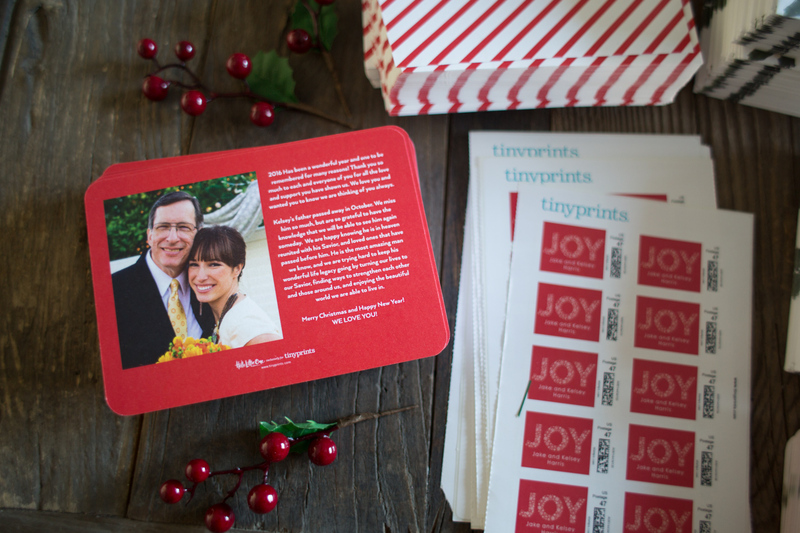 Being able to personalize the back of our cards really brought some meaning for us to our Christmas cards! 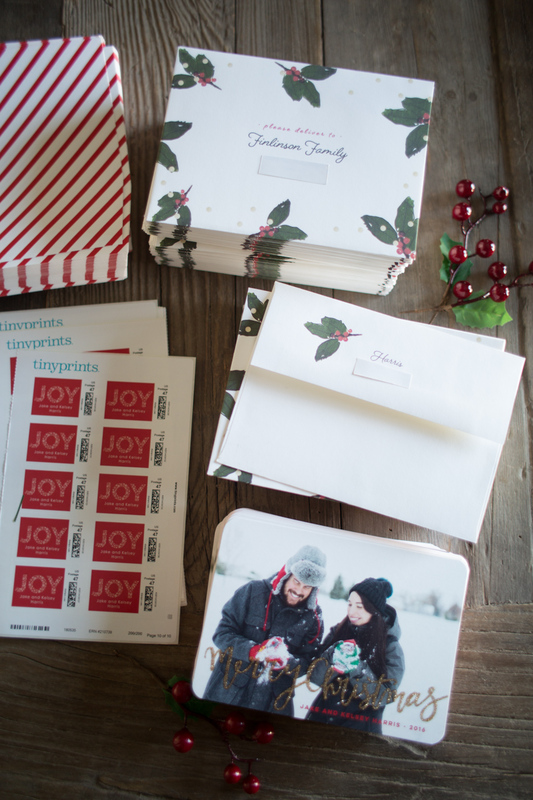 We can’t wait to send them out and let our friends and family know we are thinking of them this season! For our envelopes we went with the Holly Frost in white and a cute red and white striped envelope liners. We loved that they were so festive and went with our winter vibe for the Christmas photo we used! There were other fun envelopes to pick from but we couldn’t pass up the cute holly and flowers. 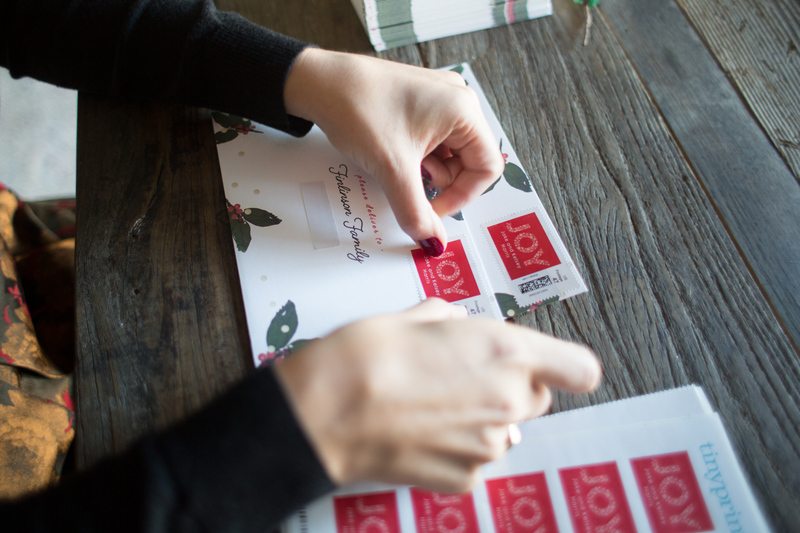 This year on Tiny Prints you can get free recipient addressing on your custom envelopes! I loved the great font options and how they really took their Christmas Card game up a notch! It was also nice to get our cards addressed so now all we have to do is stuff them and add a cute personalized postage stamp and they are good to go! With the personalized postage there are fun options to add your picture, fun text and more! It’s the perfect last touch to any holiday card! 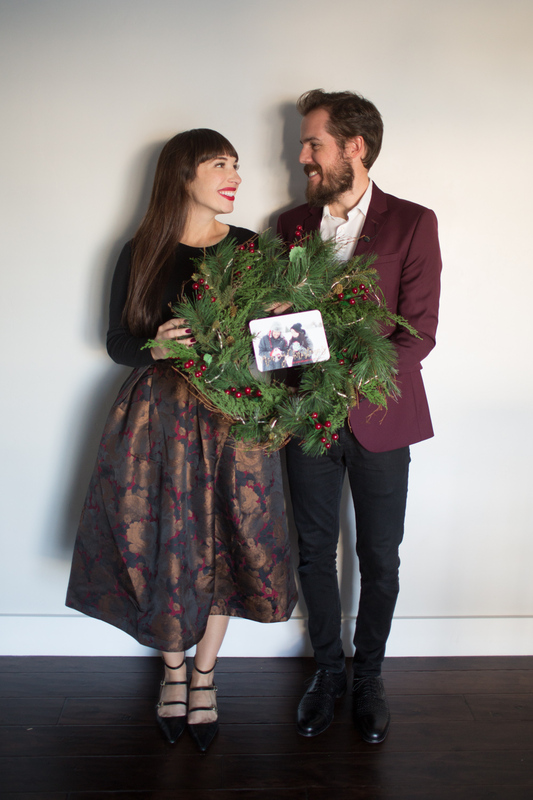 I'll love to make the "american tradition" with my fiancé this year and make christmas cards ! It's just so lovely ! Tiny prints sounds so great and easy to use. I love these pictures, you guys look great. I can't believe that Christmas is right around the corner. Crazy! Aw I love holiday cards! 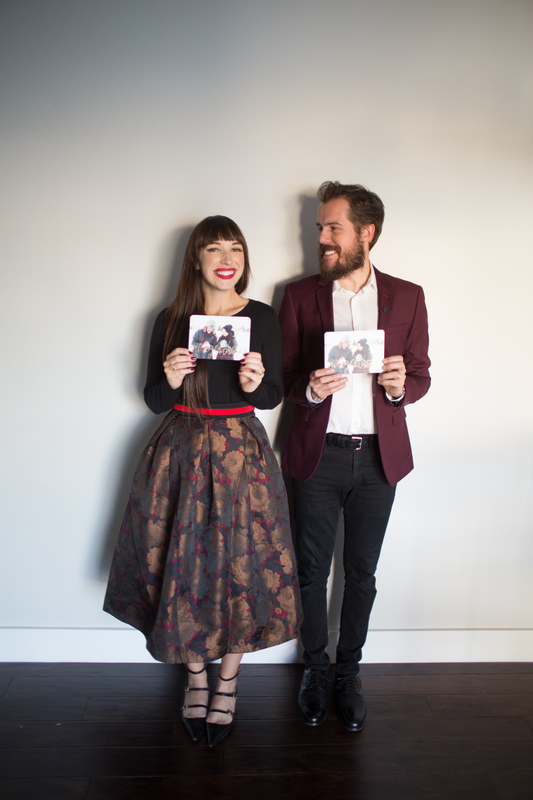 You guys look adorable in both outfits (in the cards) and in these photos! I'm in love with these holiday cards! Every year I tell myself that I'm going to have them made, then end up forgetting until it's too late. Thank you for reminding me to get on top of it!! you two are so darling! love those cards! I love these and of course love the glitter! This is a brilliant idea Kelsey, and your greeting cards look amazing! I love the attention to detail that went into producing them. It always feel extra special to receive a personalised card like this, which has been created thoughtfully and with care. Your cards look amazing and so does that skirt! Have a lovely day. you guys are seriously the cutest! And thanks for reminding me that in addition to all the wedding stuff I need form Minted, I need Christmas cards too! These holiday cards are super cute! Such a great idea! Love this super cute idea! Thank you guys for sharing! This is such a cute blog post idea! I can't wait to send out Christmas cards with my fiance 🙂 thanks for sharing! So cute! Love the way your card came out! Yay! Love your cards! I just ordered mine too. You all look great.